Bruce County, Ontario. She has worked as a chamber maid, potato peeler, data entry operator, teacher, and vice-principal of special education programs. Her fiction and non-fiction has appeared in literary journals throughout the world. 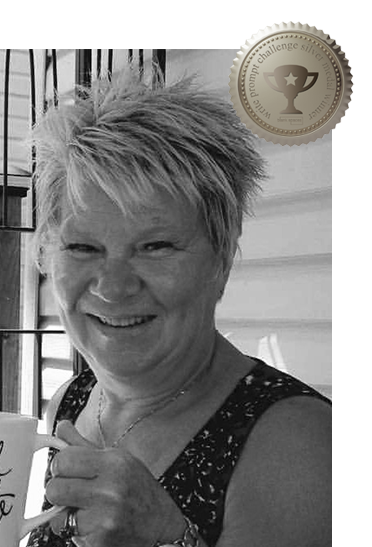 Cindy is a local judge for the Alice Munro Festival of the Short Story writing competition. She is a member of two writing groups and the Chesley library book club. Cindy and husband, John, are parents to three adult children and a grandson, Kai. Learn more at www.cindymatthews.ca, @Matthec1957, or facebook.com/CindyIsabelMatthews. Five minutes to three on a March afternoon Magda walked past the seal and polar bear installation at the Yellowknife Airport before heading for the searing cold. She’d packed suitable gear for the hostile weather with its icy chill famous for lingering well into spring. She knew how to dress because Yellowknife had once been her home. Fresh snow littered the ice-packed sidewalk and squeaked underfoot. She turned the collar up on her coat and lifted a gloved hand to hail a cab. As the driver tucked her suitcase into the trunk, a bitter gust of wind out of the north slapped Magda in the face. She could hardly wait to unpack her down-filled parka, too much coat for southern Ontario. Icy humps and dips coated the road en route to the bed and breakfast in Old Town, a place she’d call home for two days. She thought about what had pulled her from her comfy Toronto condo: a promising job interview, the new Ethiopian restaurant Trip Advisor was raving about, and an overdue visit to Lakeview Cemetery. Only this story wasn’t really about that; it was about what happened the night before she was supposed to board the plane for home. the community college, Magda swung by Lakeview Cemetery to pay respects to her mother. After, Magda played tourist. 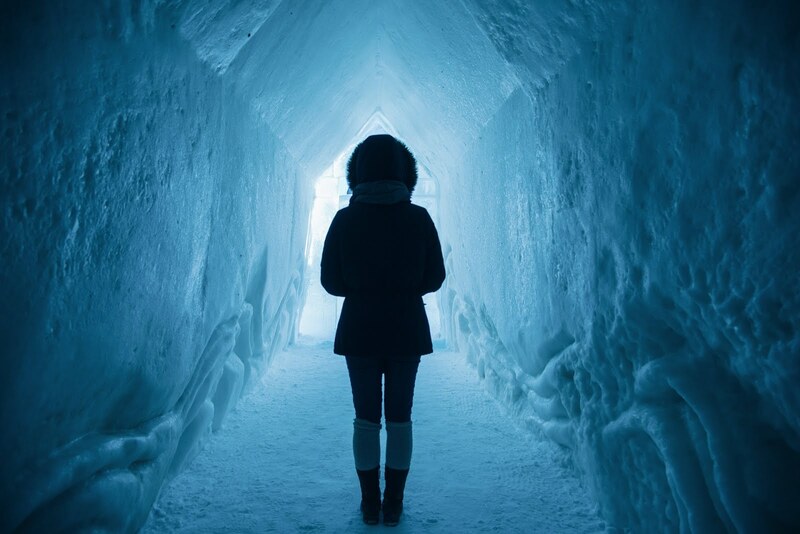 She stood on the thick black ice of Yellowknife Bay and gasped in wonder at the massive scale of the Snowcastle. To her rear was a cloudless azure sky against a pale frozen landscape dotted with colourful houseboats. The Snowcastle was a major draw for sightseers every March. Its organizer, Snowking, was a lean man with a long grey beard and a keen work ethic. Mr. Freeze, Shiverin’ Sheila, Avalanche Kidd, and other construction enthusiasts helped Snowking mastermind the design and assembly of the ice buildings and sculptures. In addition to covering the cost of flights and lodging, the college offered each out-of- territory candidate a one hour ‘nap’ at the Snowcastle. Who could turn down the prospect of viewing the northern lights? Magda hadn’t witnessed auroras in over twenty years. There was one caveat. Despite having lived in the north in her teens, nothing equipped a person for the bone-chilling cold once the sun went down. The temperature on the night of her nap was fated to drop to -30 degrees C.
The short walk from downtown to Yellowknife Bay demanded a zipped parka with buttons fastened, a tight-fitting hood, fleece-lined snow pants, insulated footwear, and a face covering pulled snug against the eyes. Even so, ice crystallized within seconds on Magda’s lashes and brow, and her eyeballs burned. In spite of the mind-numbing temperatures, her body began to sweat inside her winter wear. She fretted that, in the dark, she might not locate the Snowcastle, but find it she finally did. The massive structure surged from the frozen lake in a firestorm of blue and white spotlights. It was impossible to miss the sixteen foot walls, each boasting a width of four feet, erupting from the black ice like the snout of Ol’ Slavey, a legendary fast-moving creature thought to dwell under the ice. Shortly after midnight, Snowking arrived. His mittened hand gripped Magda’s elbow and steered her past a massive ice dragon, its gaping mouth yawning razor sharp teeth at anyone daring enough to approach. Once inside, Magda unzipped her parka and removed her hood. Strings of miniature blue lights twinkled from shelves lining the walls of the foyer. Snowking and the committee had thought of everything. As Snowking and Magda advanced, an abrupt hush greeted them, the kind of bottomless stillness that comes just prior to falling asleep. “Come on. There’s so much more,” Snowking said. Magda shadowed him through curved corridors to a miniature cafe, past the stage where music and comedy acts thrilled weekend audiences. Onto a two-storey ice slide, then past a make-shift powder room to the place where she’d linger under the promise of auroras. Magda downed a proffered goblet of mulled wine before stretching out on a foam mattress covered in sheep fur. Despite the absence of a ceiling, the cold stayed away and Magda soon began to feel toasty. As she became accustomed to the dim conditions, her eyes inhaled the stars overhead. She held her breath to will the auroras to materialize and flick their green and pink fingers against the black velvet sky. Her stomach began to rumble and her chest to feel heavy. Perhaps the injera and lamb wot she’d gobbled down at the Ethiopian restaurant wasn’t agreeing with her. Her body felt like that night long, long ago, a starlit night not dissimilar to this one, when she’d learned of her mother’s death. Her beautiful mother, en route with a photographer to interview mushroom pickers outside Hay River, crashed her car into a bison. Instantaneous death was how everyone put it. After the memorial service, Magda went south to live out her remaining childhood with her mother’s sister. During the final minutes, her back pressed against the mattress, Magda’s head twisted left and right. She remained on the hunt for auroras but this time they refused to come out to play. Magda didn’t hold it against them. She considered herself blessed despite their absence. Tomorrow morning was her second interview. Supposing they offered her the job, she knew she’d accept. Drenched with a renewed love of the north, she grinned with delight at the potential permanent return to her childhood playground. Perhaps Snowking would permit her to lend a hand at future Snowcastle builds, and christen her with a fitting ice sculpting nickname.